In Luke's vivid narrative, Jesus comes into Galilee proclaiming "good news to the poor ... freedom for the prisoners and recovery of sight for the blind." More than any other Gospel, the Gospel of Luke shows Jesus' great concern for the downtrodden, the oppressed and the marginalized--including women and children and even those outside the house of Israel. ^^Darrell Bock shows why Luke's Gospel is "tailor-made" for the world we live in - a world often divided along ethnic, religious, economic and political lines. After all, the Jesus portrayed by Luke is a source of unity for his disciples and for believers from every walk of life. Tax collectors, Roman soldiers, prostitutes, city officials, religious leaders, widows and fishermen were among the diverse group brought together in the early Christian church. 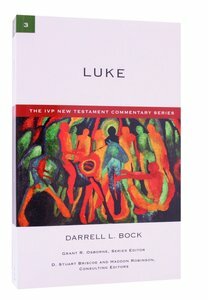 About "Ivp Ntc: Luke (Ivp New Testament Commentary Series)"
Darrell L.Bock (Ph.D., University of Aberdeen) is Research Professor of New Testament Studies, Professor of Spiritual Development and Culture (CCL) at Dallas Theological Seminary. Dr. Bock has earned international recognition as a Humboldt Scholar (Tubingen University in Germany).He is the author or editor of many books, including the two-volume commentary on Luke and the volume on Acts (Baker Exegetical Commentary on the New Testament series), Jesus according to Scripture, The Missing Gospels, Jesus in Context, and Studying the Historical Jesus.